Given the high cost for winemakers of manual data sampling, the European project VINESCOUT “Intelligent decisions from vineyard robots” is born, whose consortium is formed by the Polytechnic University of Valencia, the University of La Rioja, WALL-YE SARL, Sundance Multiprocessor Technology ltd. and Symington Family Estates. VineScout, which is based on the success of the results of its predecessor project VineRobot, aims to bring to the market an autonomous robot, whose task is to collect data on water stress and vigor of the vineyards. For this, the project has received funding of over 1.7 million euros from the European Commission, under the Fast Track to Innovation Pilot program. In this framework, on August 30, the members of the European project VineScout offered a field day in the vineyards of the winery Symington Family Estates, in Quinta do Ataíde (Portugal). 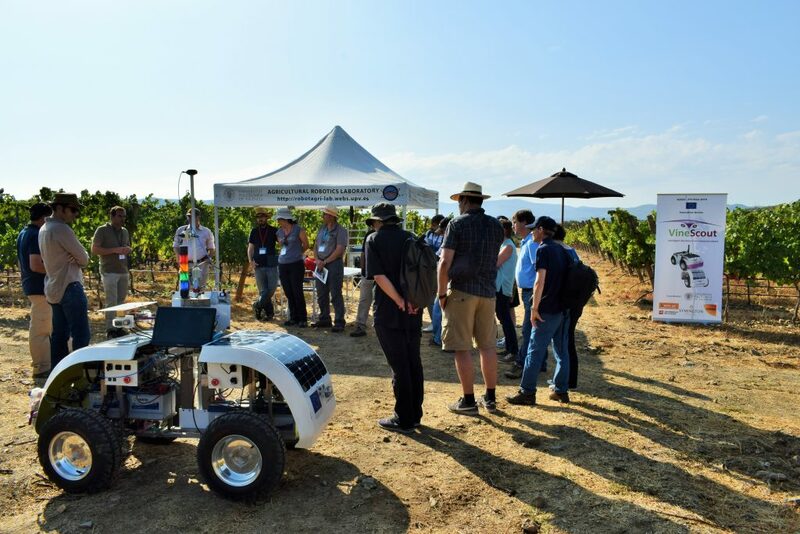 Attendees to the field day could interact with the robot, learn how to start up the prototype, follow it while traveling the field autonomously and take data automatically, or what to do to stop it in case of emergency. In addition, during the afternoon technical session, the data collected by the prototype, as well as its interpretation, were made known.